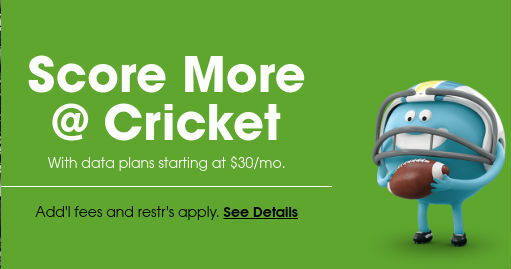 According to a rumor that's been all over the internet for nearly a month, Cricket will soon be ending their Five Lines for $100 Family Plan offer. Unfortunately it looks like the rumor is true. John from YouTube channel Magic Tech Review, shared some screenshots with me of pages from Cricket's Hoopla intranet for dealers, confirming the changes. John doesn't have access to Hoopla and didn't make the screenshots and he asked me not to post them to protect his source. In other words, the price of two and three line plans isn't changing but the price for four lines goes up $10 and five lines goes up by $30. Currently four or five lines of Cricket's $40 4 GB plan cost $100. For plans created starting Nov 5, four lines of the $40 plan will be $110 and five lines will be $130. I'm not sure what "Resuming from Cancel" means but I suspect that it means that if the customer misses a payment and their service is suspended they loose their grandfathered status. As Cricket hasn't made any public announcement of the changes to Group Save Plans, they could have a change of heart and not make these obviously negative changes. After all, competitor MetroPCS is offering 4 Lines of unlimited data for $100 and Boost Mobile is running a 5 lines of unlimited data for $100 promotion. If Cricket starts charging $110 for 4 lines and $130 for 5 lines of limited and throttled data they are going to lose lots of sales to Boost and Metro during the prime holiday season. On Howard Forums there are rumors of other changes coming to cricket, including the $30 plan getting a 2 GB allotment of "high speed" data instead of the current 1 GB, the $40 plan going from 4 to 5 GB of "high speed" data and possibly the elimination of the $50 plan and the return of the $55 3 mbps Unlimited 2 plan. However, there's no mention of any plan changes in the Hoopla screenshots so they remain rumors for now. As long as Cricket is throttled, it is not a deal worth considering. Metro and Boost have them beat on speed, coverage, and value. That's beside all the reliability issues with AT&Ts network. I don't know about coverage. In many areas att coverage is superior to tmobile/sprint. I know boost has no roaming. There's voice roaming with metro and data in some areas for additional cost. Best provider is one which meets your needs at the lowest price. It's not a one size fits all. @anonymous 9:57pm.. Boost has voice roaming. Not much, only 50 mins, but they do have roaming. Why would you pay the same price for less? Do you go to McDonald's and pay full-price for half a sandwich because its good enough? Data isn't a commodity, there is no shortage of bits. Paying for throttled service sends a message that you're willing to pay full-price for half-service. I never get that argument? Why ruin the economics for everyone else because you don't understand good value? I've traveled all over the country (rural too) and found AT&T has more deadzones and no-service than TMo/Sprint. People that complain about coverage are paid shills spreading misinformation. Y'all got your noses stuck in your phones so often that you forget there is a world out there to enjoy. Can't you go a few miles without Netflix? Anon907, you're assuming 8mbps is "half a sandwich." Andrew is saying that it's not, so the analogy is more like "would you go to McDonald's and pay for three sandwiches when one is good enough to feed you?" "I've traveled all over the country (rural too) and found AT&T has more deadzones and no-service than TMo/Sprint. People that complain about coverage are paid shills spreading misinformation." 1) No, they are referring to objective facts. At this time, AT&T (and Cricket) coverage is hugely (30% or so) bigger than AT&T. No imaginary conspiracy theory of "paid shills" can get around the cold hard facts. "Y'all got your noses stuck in your phones so often that you forget there is a world out there to enjoy. Can't you go a few miles without Netflix?" 2) Enough with the moralizing. Some need Netflix, and you don't. Fine. If you don't like Netflix, don't wathc it. You see a little worked up there. I was just asking questions I actually have. To your McD's analogy and criticisms I would 100% agree with anon1106. My question would be why do you need 3 burgers? What do you need to accomplish on your phone not on wifi that using something like 24mbps is important? Of course I would love to get 24mbps for the same price but the problem always comes back to coverage. Nationally, att has much larger coverage than sprint/tmobile. If I have to choose between uselessly high speeds and actually using my phone wherever I am, I'm going with the better coverage. It's like, where I live they don't have 3 burgers, they only have the store that offers the one burger. And that one burger is enough to fill me up...?...I would be on Boost if they had more than 50mins of roaming and I would be on Metro if I didn't live in a tmobile deadzone. I'd be on virgin if it wasn't Apple only. I don't have Netflix and I don't even have home internet. I'm not a "shill". I'm just a guy living in Wisconsin, looking for the best deal that suites me and my situation. And without home internet, I need to get as much data for the lowest price as possible while still getting decent phone coverage. Take a look at coverage maps in Wisconsin. Att and Verizon native coverage are options, sprint and tmobile arent really legitimate options. (Post paid is a slightly different story.) Check out the prepaid numbers on this very website- att added more prepaid customers than any other company which means their strategy of better coverage, less data and lower speeds is enough to hold its own over tmobile/Sprint's strategy of worse coverage, more speed and data. Again, I, more than anyone, am waiting for some coverage expansion by the smaller 2. But until then I HAVE TO settle for att prepaid and I don't see how max data speed makes for a good argument. Reading the above argument about hamburgers between Mayor McCheese and the Burger King makes me want to run out and get a sack of burgers. Yeah, the changes fueled by greed seems great to them a month ago. but now like the article points out it they have to be at least reconsidering the changes. Try Sprint's one year free plan if you have OK coverage. I think Cricket is a great value with great coverage and great speeds on a great network for a great price. Not so great, or they would have caught up to metropcs. They’re still far behind and will never catch up. To increase prices and yet remain with throttled data does not worth it. Cricket coverage will soon be a thing of the past when TMobile/metro pcs expand their coverage. Same here. Traveling throughout Oregon this summer coverage was excellent, beyond Sprint's and much better than T-Mobile's. It was beaten only by Verizon, but at 5 lines for $100 (and even at the new rate) I couldn't complain at all. Living in big city, now cricket is worthless than Metro and Boost. Maybe I might purchase cricket sim when I travel central and western coast but not for daily drive. "resuming from cancel" means if the account enters cancel status (30 days or more after being suspended) then being paid to resume service before all numbers associated with that account are recycled. Can confirm the data increases on $30 and $40 plans, also a new add a line promo is launching alongside group save changes. More details incoming on Nov. 5th!! Yes Cricket better explain about group discount being changed to their customers before many start seeing a huge price increase after making a plan change. The old plan of 4 lines for $100 & getting a 5th line FREE never made sense to me. Great deal, but always intended to simply acquire more subscriber #s & debit/credit auto-pay accounts. This new plan layout is much more sensible. 4-lines for $110 is still a great deal.